Yesterday someone on WB asked what kind of saw blade was being used in a utube video. I gave my best guess. The thought stuck in my mind. I knew that a plywood blade worked backwards, but wanted to try it going forward. It works just fine. Here are a couple of photos. I stopped the saw in the middle of a cut to take the shots. I was in a hurry and made this little tag to be left on the cut off piece. E - Expansion Slots. Laser cut expansion slots in some saw blades that make room for blade plate expansion caused by heat from friction. G - Gullets. The space cut out from blade plate between the teeth of a saw blade. The gullets provide room for chips and waste to exit the cut. H - Hook Angle. The amount that a saw blade tooth either tips toward or away from the direction of the blade rotation. A zero degree hook angle means that the face of the teeth are in line with the exact center of the blade. K - Kerf. The slot a saw blade cuts into a material. A 10' "full kerf" saw blade usually has a kerf width of around 1/8'. A 10' "thin kerf" will typically have a kerf width of approximately 3/32' (.094'). L - Kickback Limiters. Some blades have kickback limiting tabs positioned behind the saw blade teeth to help keep the blade from over-feeding. P - Blade Plate. Saw blade plates are usually made of hardened steel, which is tensioned to prevent the blade from becoming "floppy" due to centrifugal force at high rotation speeds. Flat Top (FT) Flat top teeth are used on blades made for ripping hard and soft woods. Since wood is much less likely to chip and splinter when it is being cut in the direction of the grain, the focus of a rip blade is to quickly and efficiently remove material. The flat top tooth is the most efficient design for cutting and raking material out of the cut. Alternate Top Bevel (ATB) "Alternate top bevel" means that the saw blade teeth alternate between a right and left hand bevel. This tooth configuration gives a smoother cut when crosscutting natural woods and veneered plywood. The alternating beveled teeth form a knife-like edge on either side of the blade and make a cleaner cut than flat top teeth. Combination Tooth (Comb.) The combination (4&1) configuration is used for "combination" blades -- blades designed to do both crosscutting and ripping. The teeth are arranged in groups of five - four ATB teeth and one FT -- with a large gullet in between the groups. Triple Chip Grind (TCG) The TCG configuration excells at cutting hard materials like laminates, MDF, and plastics. Teeth alternate between a flat raking tooth and a higher "trapeze" tooth. The TCG configuration is also used for non-ferrous metal cutting blades. High Alternate Top Bevel (HiATB) The HiATB configuration is used for extra-fine crosscutting and to cut materials surfaced with melamine, which is prone to chipping. The high bevel angle increases the knife-like action at the edge of the blade. You can cut aluminum with any carbide tipped blade. A higher tooth count will cut smoother, but any will work. But PLEASE BE CAREFUL cutting on an an exposed blade raised that high!!!! Also, fine aluminum shards will fly everywhere so wear safety glasses!!! I have been using a dremmel tool with a reinforced fiberglass cutting disc. No flying shards and the cut is fairly neat. I turn the can towards the disc and the disc is turning towards me. I use a piece of grit cloth to smooth the edges. zelph wrote: Yesterday someone on WB asked what kind of saw blade was being used in a utube video. I gave my best guess. The thought stuck in my mind. I've also cut them with a power miter box(fine tooth carbide blade) or set up a jig that holds the can on the router table.On the router table the 1/8" bit only sticks up about 1/8";roll the can against an adjustable stop piece on one end(for length of can section) and a fixed fence on the back to hold it against..a lot safer than other methods..Pretty hard to get hurt unless you REALLY try to.. I do the crown cut about the same way..set the bit for height barely above the can's metal,then set a stop on the fence how deep I want the cut.Make marks around the perimeter of the can(or thicker aluminum bottle)where I want the crown cuts..then plunge cut the end of the can to the stop fixed on the fence behind the bit..usually only about 1/4"-3/8" deep,while holding the can against the fence..another safe method. I don't know about cutting cans with a table saw..I've had saws catch things and whiz them past my ear..stuck in the sheetrock behind me(close to taking my head off!).. ..The neighbor lost a few finger tips a couple years ago cutting a small piece of wood..and he's the most careful person I know.Fullsized tablesaws shouldn't really be used for cutting anything under a foot long..You are asking for stubby fingers or something stuck into your forehead since the blade is spinning right towards you!JMHO.. I do a lot of finer work using smaller pieces of wood building large format cameras. so I do work with a lot of smaller wood pieces and aluminum stock.To make it safer cutting smaller pieces,I mounted a small makita 4" carbide skil saw through a second table(dual craftsman 10" cast iron tables) that doesn't have the power and torque of a larger one..and I can cut 1/16" wide grooves for glass placement and things with that in pieces as small as 1x1/2x8" long.It's a LOT safer than the full size one.That would work well for cutting cans.Smaller than about that I set up the router table if I can. 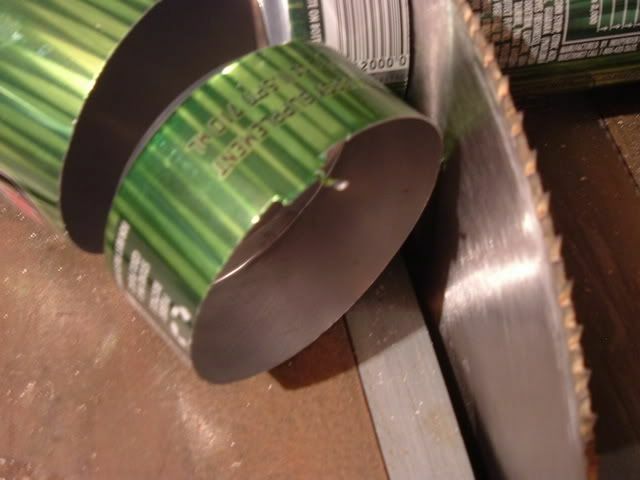 I understand it is nice to cut through a full can,but you may want to set up some kind of carriage that will slide in the grooves where you don't have to hold on to the can itself...something with an adjustable end that you can preset for cutting a lot of cans in the same place...maybe use a block for a spacer for making the second cut so you don't need to really adjust anything..make a cut,put in a block because the can is shorter,then cut the other end off..whatever it takes. 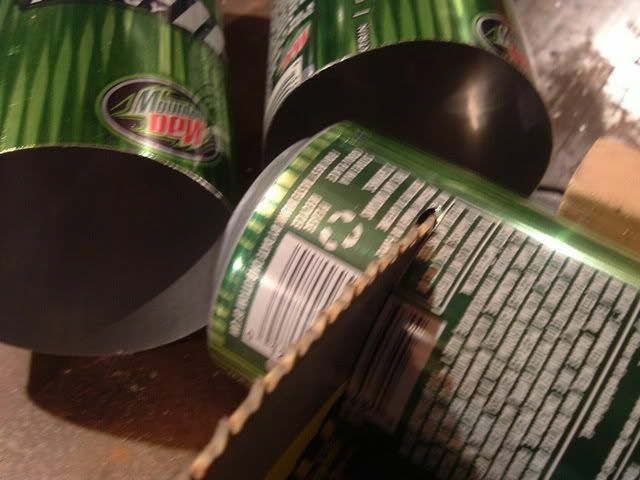 Is there any kind of knife that can cut a can? Is it possible? so..is this spam or a legitimate question? Haven't you ever watched a ginzu commercial? Definite spammer. IP had about 20 hits on the SFS website. The infiltrater has been handcuffed and held for interrogation! but SOG are some of the best knives on the planet! very pricey too.